Aspiring doctors in Sri Lanka and the region can, for the first time gain a degree in medicine at one of the best medical schools in the UK whilst completing the final clinical years of their studies in Sri Lanka. The University of Aberdeen, Scotland, has launched the new Sri Lanka Medical Pathway which will see Sri Lankan students spend three years studying in Scotland and the final clinical years working in hospitals in Sri Lanka. The new initiative will give Sri Lankan and regional medical students a unique opportunity to gain experience working in two healthcare systems. Founded in 1495, the University of Aberdeen is the fifth oldest university in the UK. Aberdeen’s medicine programme was recently ranked the best in Scotland and fourth in the UK. Overall, the University is ranked within the Top 30 in the UK and Top 160 in the world. Years 1-3 are delivered in Aberdeen, on one of the largest health campuses in Europe, by experienced clinicians at the forefront of modern clinical practice and research. There are opportunities to apply for summer research scholarships and in final year to spend eight weeks studying abroad. Years 4-5 will be spent in Sri Lanka, facilitated by the International Institute of Health Sciences (IIHS) where students will be supported by Sri Lankan-based University of Aberdeen staff. Graduates will receive a University of Aberdeen MBChB degree, which is a primary medical qualification (PMQ), which currently entitles graduates to apply for provisional registration with the UK General Medical Council. 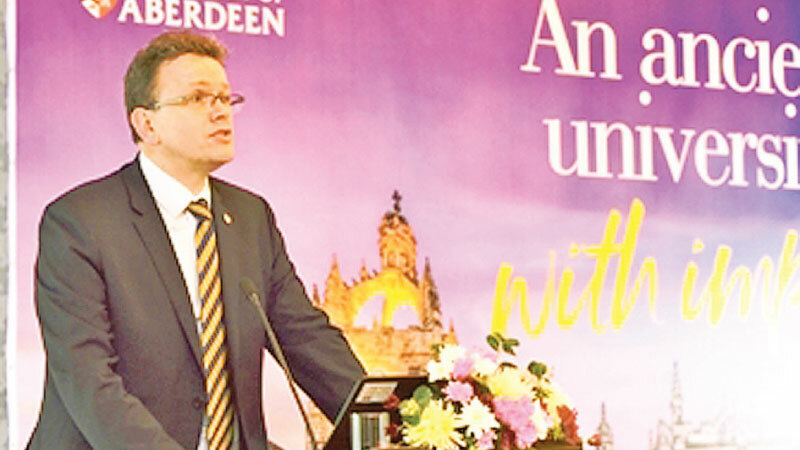 Professor George Boyne, Principal & Vice-Chancellor of the University of Aberdeen said: “Throughout our history, stretching more than 520 years, the University has taken pride in being open to the world and this new Sri Lankan Medical Pathway is another example of us continuing this philosophy today. Professor Roney Patey (Director, Institute for Education in Medical and Dental Sciences, University of Aberdeen), added: “We’re so excited to be launching this new programme which will give Sri Lankan and regional students the best of both worlds – the chance to study at one of the most respected medical schools in the UK, and also the chance to complete their clinical years of study in hospitals in Sri Lanka.